On Aruba, it’s possible to dive 130 feet under the water without getting wet. 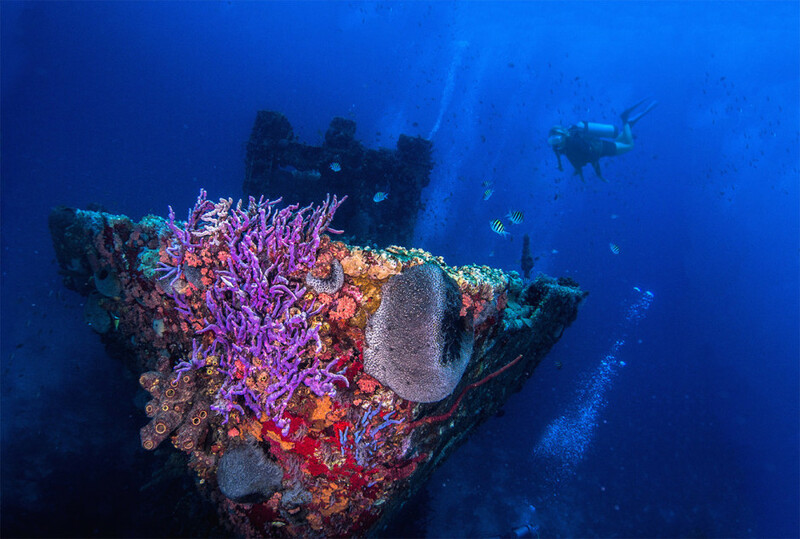 Join an Atlantis submarine exploration of the German Antilla shipwreck, scuttled during World War II, and follow Aruba’s southside dropoff reefs as you go into the deep, watching the tropical fish shimmy past your window as you glide. You might also want to head out on one of the more than a dozen catamarans and trimarans that ply the coast. From bigger, lively boats like those of Red Sail Sports, through to smaller, owner-operated sailing cruises (try Octopus or Tranquilo), you can choose your vibe. They’ll provide the snorkel lessons, equipment, and snacks and drinks to share under the Aruban sun. Ever heard of SNUBA? It’s a bit like scuba diving, except multiple breathers are attached to a single tank that remains at the surface. The maximum dive depth is about 20 feet — more than deep enough for you to ogle the marine life from your modern version of an old-fashioned diving helmet. For the ultimate adventure, though, SCUBA is still the way to go. Aruba is the best place in the Caribbean for wreck diving, and its shallow reefs and dropoff dives plunging to 100 feet make for some truly unique underwater experiences. You don’t need to have dived before — complete a PADI introductory course and you’ll be ready to take on the novice and intermediate dives to the Pedernales and Antilla shipwrecks. On the off chance that sipping piña coladas on the beach for a week straight loses its appeal, the island is full of other, more high-octane adventures. A session with Skydive Aruba, for example, will have you soaring 10,000 feet above paradise. If you’re new to the sport, you’ll jump in tandem with an experienced trainer, meaning you can enjoy views of the island and all the way out to Venezuela’s coast while your expert buddy controls the jump. Even if diving out of an airplane isn’t for you, an amazing 360-degree panorama of Aruba is still accessible — you’ll just need to work for it. 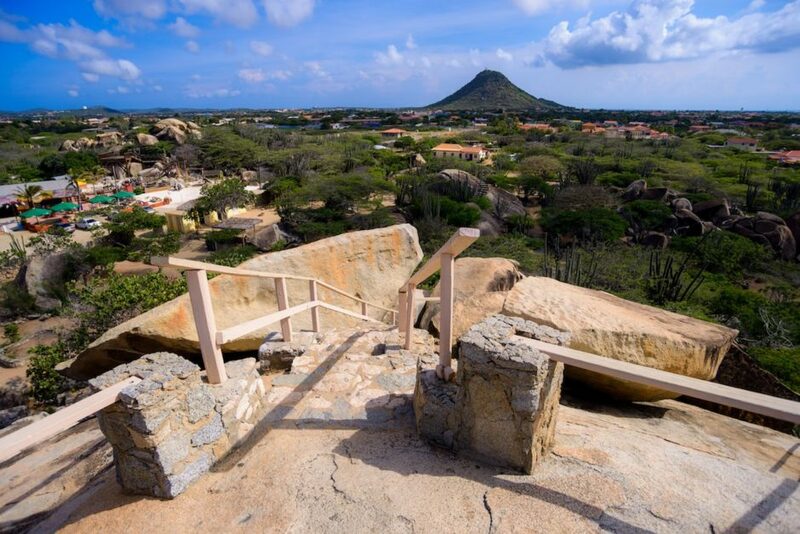 Walking the steps up Hooiberg, or Haystack Mount — a name you’ll fully comprehend once you see the volcanic formation — has long been one the island’s best fitness challenges. Rising 541 feet above the sea, the summit isn’t scarily high, but the mental challenge of conquering the 560+ steps to the top makes the climb all the more difficult. They aren’t exactly ergonomically designed, so it is a workout, albeit a really fun one. Your reward on reaching the peak is views that stretch for miles. On a clear day you can see all the way to the mountains of the Paraguaná Peninsula and the port town of Punto Fijo in Venezuela. Beachside sunset dining is common on Aruba’s southwestern shore. And a number of resorts — including the The Hilton Caribbean, Hyatt Regency, and Marriott Resorts — can make sure you get a romantic beachfront dinner for two. Under the stars, perhaps? You can also wiggle your toes in the sand while dining under the tiki torches and palm trees at local restaurants like Flying Fishbone, in the pretty fishing town of Savaneta, and Eagle Beach’s Passions on the Beach. For the thrills of toes-in-the-water sailing, check out the Tranquilo — a single-hulled sailboat that heels at radical angles in strong winds, one of the very few monohulls you’ll see on Aruba’s coast. Board the boat for a private, four-course dinner for two, and you’ll tuck into starters at sunset and enjoy dessert under the light of the moon. 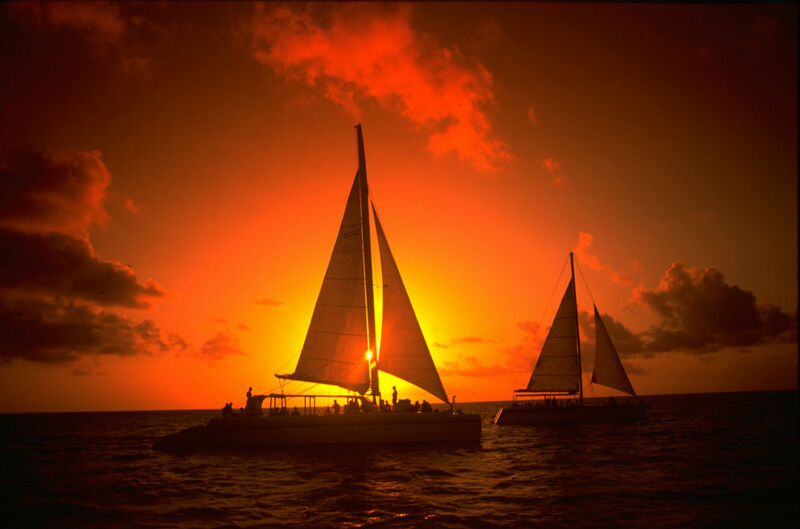 Or head out with Red Sail Sports for a Caribbean-style buffet dinner while you sail. Wednesdays involve welcome champagne, grouper with creole sauce, and fresh fruit tarts prepared by some of the island’s top chefs; Tuesdays are just as lively, with live steel drum music and an open bar featuring all the Caribbean cocktails and local Balashi beer you ever could want. Store-bought souvenirs are fine and all, but why not up the ante and come home with a necklace, bracelet, or keychain that you designed and crafted? Aruban artists Ciro and Marian Abath use Murano glass to create one-of-a-kind artwork at their countryside studio, Terrafuse, located in the back of their traditional cunucu house. And they can teach you how to do it, too, in their twice-weekly glass bead workshops. Or just stop in and pick up a beautiful piece — or three — from the Abaths’ gallery. Madi Kock’s family has been living in Aruba for many generations — probably one of the reasons she’s able to give one of the coolest tours on the island. Madi will pick you up in her safari 4×4 Jeep at 5:30am and take you to Conchi Natural Pool on the northeast coast, where you’ll watch the sunrise spill light over the dramatic lava rock formations. It’s one of the most popular out-of-the-way sights within Arikok National Park — and at this early hour, there’s a chance you might have the place all to yourselves. Around the time of the full moon, head out on an evening tour back to Conchi, to the abandoned Bushiribana Gold Ruins, or to the iconic Alto Vista Chapel, first built in 1750. Tip: You’ll want to bring your camera and tripod on these trips; the moonlight silhouettes you’ll be seeing are otherworldly. 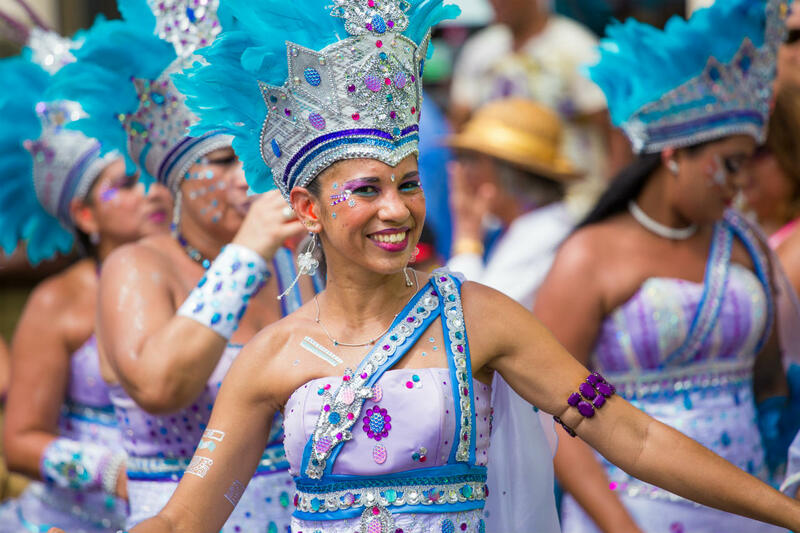 On Aruba, Carnival season isn’t just one week of festivities — it begins in January and extends all the way till the stroke of midnight on Ash Wednesday (March 1, 2017). The best part? You don’t have to remain a spectator — you can actually take part in the parades. Contact SMAC for info on the various Carnival groups and event schedules. There’s a fee for participating, but it’ll include all your food and drink for the day, you’ll get to hang out with some of the friendliest people on the island, and you’ll go home with a brilliant costume. Oranjestad or San Nicolas Children’s Parade — Cuteness personified! Grande Parade Oranjestad — all the carnival groups appear in full force, going all out with amazing floats and costumes. If your idea of a fun New Year’s Eve is standing around in the freezing cold waiting for a ball to drop, you’re in for a revelation. 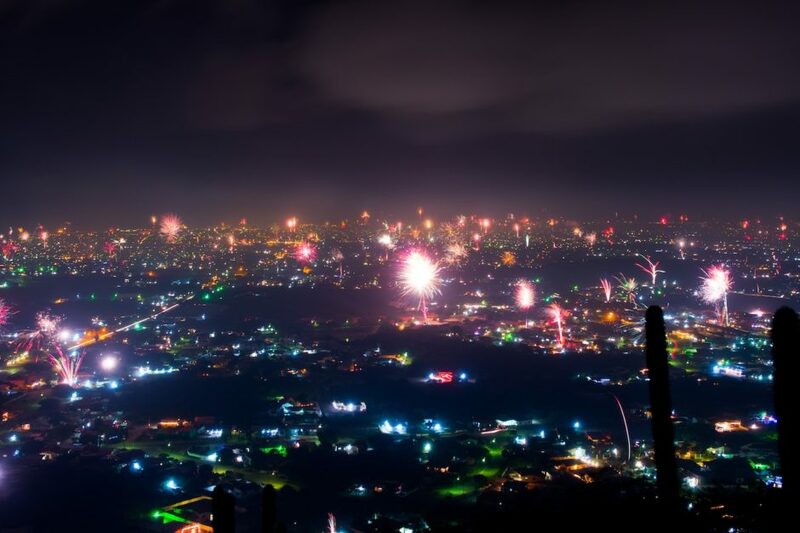 There’s no need to suffer frigid noses and toes; on Aruba, you’re in for a warm, breezy night chock full of fireworks. Island tradition demands that with the close of Christmas comes the selling of fireworks and five days of pyrotechnic celebration. Several businesses and resorts host professional displays, and every home has a stockpiled collection ready to illuminate the final night of the year. Among the various fireworks sold, a requirement is a pagara — a circular roll of firecrackers that may number anywhere from 5,000 to over 5 million. It’s believed that by lighting a pagara and allowing the resulting smoke to waft through your home or business, you dispel the fuku, or bad vibes, accumulated over the past 12 months. The building is then cleansed and refreshed, ready to welcome a prosperous new year. Most stores and offices will light their pagaras at the closing of their business year. The granddaddy of them all is the remarkable, and seemingly endless, string of firecrackers provided by the Renaissance Aruba Resort. Their pagara gets laid out on L.G. Smith Boulevard in Oranjestad at midday on the 31st, and it usually takes at least half an hour until it completely runs its course. If you’re staying in a hotel where your room or terrace is elevated, you’ll have an ideal vantage point for this island-wide display that continues for hours and hours. At the stroke of midnight, as nearly every home and open business sets their pagaras alight, you’ll be convinced you’re in a battleground — the thunder is deafening. Other good places to see the show? From the beach, of course. The streets surrounding Oranjestad harbor will fill with spectators to see the Renaissance Resort display. See you at the docks!